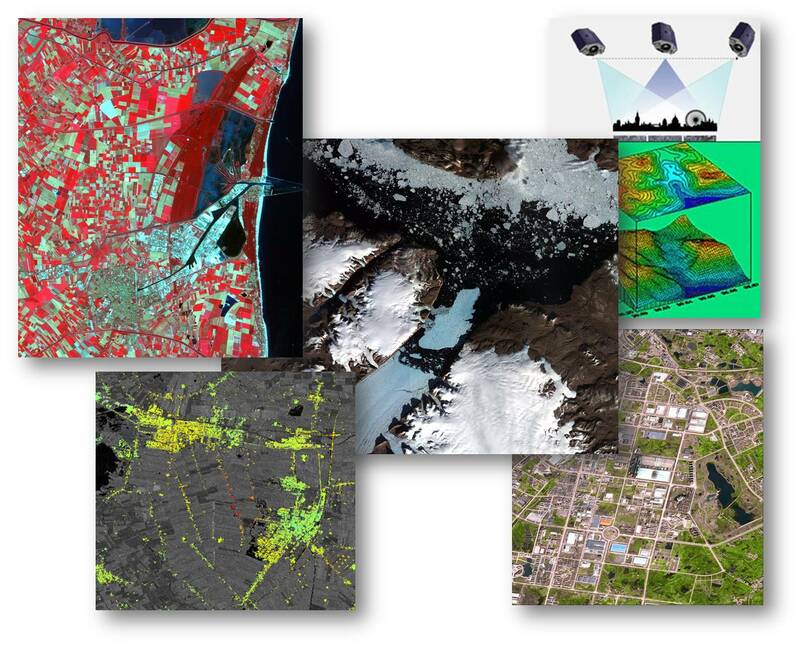 Earth observation is the collection of information about planet Earth's physical, chemical and biological systems via remote sensing technologies, integrated by surveying techniques, collection, analysis and presentation of data. A satellite is any object that moves in a curved path around a planet. The path a satellite follows is an orbit. The shape of a satellite's orbit is an ellipse, and the planet is located at one of the foci. As a result, the net force applied to the satellite isn't uniform all the way around the orbit, and the speed of the satellite changes constantly. It moves fastest when it is closest to the planet (perigee) and slowest when it is farthest from the planet (apogee). Weather satellites: contain cameras that can return photos of Earth's weather, either from fixed geostationary positions or from polar orbits (Geostationary Operational Environmental Satellite - GOES). Military satellites: applications may include relaying encrypted communication, nuclear monitoring, observing enemy movements, radar imaging and photography. Scientific satellites: look at everything from sunspots to gamma rays (Hubble Space Telescope). Communications satellites: the most important feature is the transponder - a radio that receives a transmission at one frequency and then amplifies it and re-transmits it back to Earth on another frequency. Communications satellites are usually geosynchronous. Navigational satellites: help ships and planes navigate (GPS NAVSTAR). Earth observation satellites: check and monitor the planet's status and the changes in the natural and man-made environment (Landsat). The actual satellite orbit that is chosen will depend on factors including its function, the area of interest and its application. While geostationary orbits are popular for applications such as for communications satellites, other satellites such as GPS and even those satellites used for mobile phones are in much lower orbits. As satellites orbit the Earth they are pulled back in by the force of the gravitational field. If they did not have any motion of their own they would fall back to Earth. Instead the motion of the satellite rotating around the Earth has a force associated with it pushing it away from the Earth. For any given orbit there is a speed for which gravity and the centrifugal force balance each other and the satellite remains in a stable orbit. The lower the satellites orbit the Earth, the stronger the gravitational pull, and the satellite must travel faster to counteract this pull. Further away, the gravitational field is less and the satellite velocities are correspondingly less. -Inclined orbit: An orbit whose inclination in reference to the equatorial plane is not 0. Polar orbit: An orbit that passes above or nearly above both poles of the planet on each revolution. Therefore, it has an inclination of 90 degrees. Polar Sun-synchronous orbit (SSO): A nearly polar orbit that passes the equator at the same local solar time on every pass. Useful for image-taking satellites because shadows will be the same on every pass. -Non-inclined orbit: An orbit whose inclination is equal to zero with respect to some plane of reference. Ecliptic orbit: A non-inclined orbit with respect to the ecliptic. Equatorial orbit: A non-inclined orbit with respect to the equator. Near equatorial orbit: An orbit whose inclination with respect to the equatorial plane is nearly zero. Radial orbits can be either open or closed. Synchronous orbit: an orbit whose period is a rational multiple of the average rotational period of the body being orbited and in the same direction of rotation as that body. In practice, only 1:1 ratio (geosynchronous) and 1:2 ratios (semi-synchronous) are common. Geosynchronous orbit (GSO): an orbit around the Earth with a period equal to one sidereal day, which is Earth's average rotational period of 23 hours, 56 minutes, 4.091 seconds. For a nearly circular orbit, this implies an altitude of approximately 35,786 km. Geostationary orbit (GEO): A circular geosynchronous orbit with an inclination of zero. To an observer on the ground this satellite appears as a fixed point in the sky.